The Little Juniata River, a 35 mile tributary of Juniata River, begins humbly in Altoona when several small streams merge. Known locally as the "Little J" or simply the "J," the river flows northeast from Altoona through the Logan Valley. This part of the river is a freestone fishery for predominantly stocked trout, but that changes quickly when the Little J bends sharply southeast at the town of Tyrone. Below Tyrone, the Little Juniata flows against high limestone cliffs and receives in-flows from dozens of large limestone springs which cool the river and add nutrients. The river‘s deep, chalky-green pools and numerous riffles create the perfect environments to grow truly large trout. The J is a beautiful river, dotted with hand-cut stone railroad arches. But it becomes particularly scenic below Spruce Creek‘s convergence, as it flows through the roadless "gorge" section within Rothrock State Forest. 13.5 miles of the Little Juniata River, from the bridge at Ironville to its confluence with the Frankstown Branch near Petersburg, is regulated as All Tackle Catch and Release. This special protection ensures that the river‘s wild brown trout are able to thrive and attain proportions that are uncommon in the Northeastern U.S. In addition to the wild trout, Pennsylvania stocks 30,000 brown trout fingerlings into the river each year. But these fish quickly adapt to their surroundings and by the time they reach 10 to 12 inches (average size), it‘s impossible to differentiate between the truly wild trout and the newly "wild" stocked fish. Map ©2012. Used with permission. "Trout Streams of Pennsylvania" by Dwight Landis. Ken and Kathy Rictor, Bryan Meck and I headed toward the Little Juniata River. Ken had aske me to show him some hatches on central Pennsylvania streams. After a breif early-morning shower the weather turned downright chilly. When we arrived at the river just above Barree the air temperature hovered around 45 degrees. this late May day proved to be one of the coldest on record. Ken and Bryan became even more apprehensive about our chances of success that day as we hiked a mile upriver to our final destination. I assured them that often on a cold overcast day anglers witness some of the greatest hatches, especially in late May. These cold days prevent emerged mayflies from taking flight and any mayfly that has appeared on the surface stays there for a long time. And an overcast, rainy day and trout rise throughout the day. Almost on cue a heavy Sulphur hatch began within minutes of our arrival. Twenty trout took up feeding positions in front of us. We caught none of them. Within minutes a heavy unexpecxted Green Drake joined the Sulphur on the surface. Only occasionally did any trout come to the surface for one of these large mayflies. Ken, Bryan and I had more than 50 trout feeding on the potpourri in front of us. Some trout fed on the Sulphurs and others on Green Drakes. Add to this a good hatch of Little Blue-Winged Olive Duns (Baetis tricaudatus), plenty of Slate Drakes, and Blue Duns (Baetis species) and you can visualize the feeding frenzy that took place. It appeared that the trout fed on all four hatches, but the majority keyed in on the Sulphur and the Green Drake. Ken and I tied on Sulphur patterns and Bryan continued to use the larger Green Drake. Ken picked up three heavy browns in the glide he fished, and Bryan and I picked up several on Sulphurs and Green Drakes. It hasn‘t been that long that the Green Drake has appeared on the river. For mor than 20 years I‘d see a half dozen or so each evening for a week around the end of May. Then in May 1987 the hatch blossomed into one of the more spectacular on the river. The Green Drake seem to move upriver, lasting almost five days in any one area. The hatch normally beings around May 23 in the Petersburg area and continues upriver to the town of Spruce Creek. You can expect to see the hatch near Spruce Creek about five days later than at Petersburg. Above Spruce Creek the hatch remains unimportant. The hatch is important on the river becuase it brings the really big Juniata River browns to the surface. In one day of fishing the hatch I saw Bob Baker of Huntingdon catch a 20-inch brown; Ray Yunk of Pittsburgh land a 26 1/2-inch brown; and Bill Simmeth of Pittsburg release three 18-inch trout. If you‘re lucky and you hit cold, cloudy weather during the Drake hatch you‘re likely to witness the hatch all afternoon. During one Green Drake hatch recently I fished with Jim Ravasio, Andre Lijoi, Jim Herde, and Ken Rictor. One each of five days we hit hatches of Drakes that began around 1:00 P.M. and continued until 7:00 P.M. When the cool breezes of evening began the hatch ended. Often during the Green Drake hatch you‘ll also see the smaller Sulphur appear on the surface. Trout often prefer the Sulphur over the much larger Green Drake. When the river hosts one if its multi-hatch days and you witness a half-dozen hatches appearing at the same time, you can be in for a frustrating day of fly-fishing, unless you sit back and decern what‘s happening. You‘ll see maybe a half-dozen trout feeding on Green Drakes, 20 trout feeding on Sulphur duns and emergers, a few trout feeding on Little Blue Winged Olive Duns, a couple feeding on Gray Foxes, and a couple on Slate Drakes. During this multiple-hatch time watch with the trout are feeding on in front of you and fish to trout feeding on what you‘re copying. If you‘re using a Sulphur imatation, they try to cast to trout taking the Sulphur natural. Evening spinner falls can be impressive on the river-and also frustrating. Fish a riffle area in late May around 8:00 P.M. and you‘ll see Sulphur Spinners, Ginger Quill Spinners and Coffin Flies, usually in that order, falling onto the surface. If you‘re prepared with spinner imatations, and if you switch when you see trout changing from one natural to another, you can experience a spectacular evening. You‘ll encounter great hatches throughout the year on the river. Caddis flies appear from April until late September in colors ranging from green to tan to brown. Within the past few years a Grannom has reappeared on the river in April. Little Blue-Winged Olives emerge in the Little Juniata River in March, April and May and again in September and October. Light and Cream Cahills appear in May, June and July on the river. One of the last hatches to appear, the White Mayfly, fills the surface in late August. The best area to fish this hatch is from Petersburg to Barree. The river is still in a state of flux and hatches change from year to year. In the past 10 years the river has added a good Gray Fox, Blue-Winged Olive Dun, White Mayfly, Green Drake and Grannom, Additional hatches will probably appear in the future. 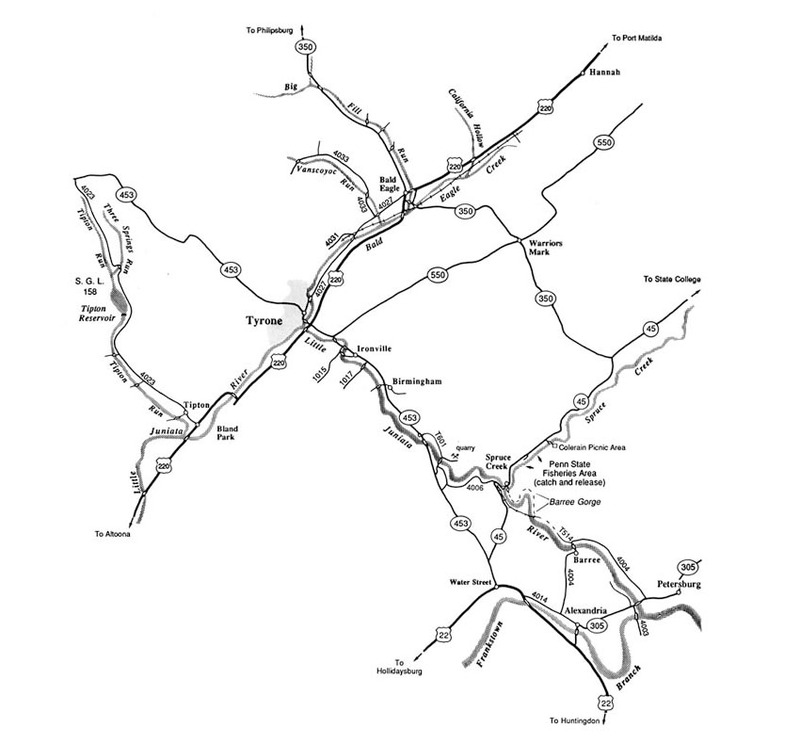 The Little Juniata River flows south from Tyrone to Petersburg in central Pennsylvania. Upriver from Tyrone the main river is marginal at best, except in sections where the main steam picks up productive tributaries like Bells Gap and Tipton runs, and a large tributary, the Bald Eagle. Downriver a few hundred yarts from the town the river enters a narrows with high limestone cliffs. At this point, the Juniata becomes a limestone river. For the next 10 miles, to the town of Spruce Creek, the river adds at least 10 limestone springs of various sizes; these aid in keeping summer temperatures low and providing moderate flow all season. The Little Juniata is easily reached from Tyrone south for six miles via PA 453. From that point paved secondary roads parallel most of the stream to Spruce Creek. From Spruce Creek to Barree the only access is by foot. This latter section, about four miles long, contains some 15-foot-deep pools, productive riffles, heavy hatches, and plenty of wild trout. From Barree to Petersburg, about five miles, a paved secondary road again parallels the river. In this section, the river expands and contains fewer smaller trout, but it has some lunkers over 20 inches. Pools are deep and wading is dangerous in this lower end. PA 305 crosses the river near Petersburg, and 300 yards below, the Little Juniata joins with the Frankstown Branch to form the Juniata River. Here the two rivers form the upper end of Warriors Ridge Dam, a hydro electric project. Trout fishing on the upper river is open year-round with a three-trout limit in effect from Labor Day until the opening of the season in April. The river is a sizable one, ranging from 30 to 60 feet wide with a moderate drop of 15 feet per mile. It contains many good-sized pools, some of them 100 yards or more long. Riffles and moderate water abound, and these sections teem with trout. Wading in the river is treacherous, and it‘s not uncommon to fall at least once every season. The water hides countless medium-sized boulders covered with a slippery film. Some fast-water sections are impossible to cross or wade. Just 25 years ago the Little Juniata River looked and smelled like an open sewer. The federal, state and local governments poured millions of dollars into the cleanup. They installed sewage plants in many of the upriver towns, and mandated that companies eliminate much of their waste. Years and years of work and millions and millions of tax payer dollars and their efforts paid off. The Little Juniata has returned-returned from a dead river void of hatches and streambred brown trout to a living, dynamic river ready to produce still more new hatches. In 1992 some of the prime river on the river went private. Several land-owners formed a private club on the supposedly navigable river. Overzealous fly-fishers paid to join the club. The future for public fishing on the river looks bleak. Millions spent by taxpayers to clean up the river and eventually only a few will benefit. Where is the justice in all of this? Did the fly-fishers who joined the private club realize that they might be instrumental in closing down the entire river? Pollution problems have abated, but there are new concerns other than posted land. Present regulations on the Little Juniata allow year-round fishing. The liberal creel limits play havoc with the trout population. From November to March bait fisherman tend to keep many of the past year‘s fingerlings that have grown to seven and eight inches long. Trout size in the river has decreased dramatically since my first visit in 1972 because of the put-and-take practices of many fisherman. Unless these anglers change their attitude, or until the Fish Commission places special regulations on the river, fishing over the great hatches from May to October will often produce only unimpressive trout. Allan Bright‘s Spruce Creek Outfitters [and TCO Fly Shop in State College] serves fly-fisherman well with hatching information and sells patters to copy all the hatches on the river. Tucker and Jean Morris run the Trout and Grouse Bed and Breakfast across the street from Allan‘s shop and Jim and Sharon Dell operate one three miles up Spruce Creek. Fish the Juniata from mid-May through early June. Arrange to be on the river before 6:00 P.M. and you‘ll likely hit a bonus hatch of Light Cahills. Then wait until you witness teh king of hatches around 8:30, the Sulphur. See the Hatch Chart and Stream Maps for more information on Little Juniata River hatches as well as best times and places to fish. Also, please visit Charles R. Meck at (charlesmeck.com) and look at his great selection of fly fishing books and his current schedule of appearances, book signings and educational events.